View cart “Colorless Tsukur” has been added to your cart. Hi! It's Stan Shinn. Want to find a conversion guide for early edition D&D modules? Want to create a conversion guide yourself and put it up for sale? Then this site is for you! We will be providing templates and support for folks wanting to create module conversions. You will get all the profit for your creations; we're just here to provide standards and support! Check out the list of modules we're currently converting. Want to see 'Classic Modules Today' conversions already done? Search the DMs Guild under 'Classic Modules Today'. 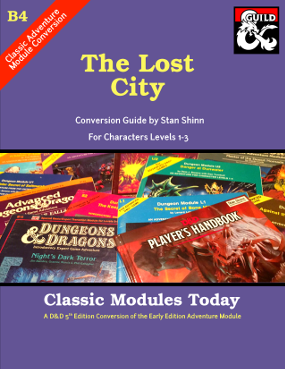 The first early edition module converted to 5e and made available at the DM's Guild is 'B4 The Lost City'. This conversion guide can be downloaded as a 'Pay What You Like' product from the DM's Guild. Download it and give us feedback! This conversion guide also serves as a template for other module conversions we are looking for volunteers to create. Source files to create the interior and cover are included in the B4 conversion guide above.